The other day, I decided to try making some car seat and stroller toys for our new baby girl to look at. 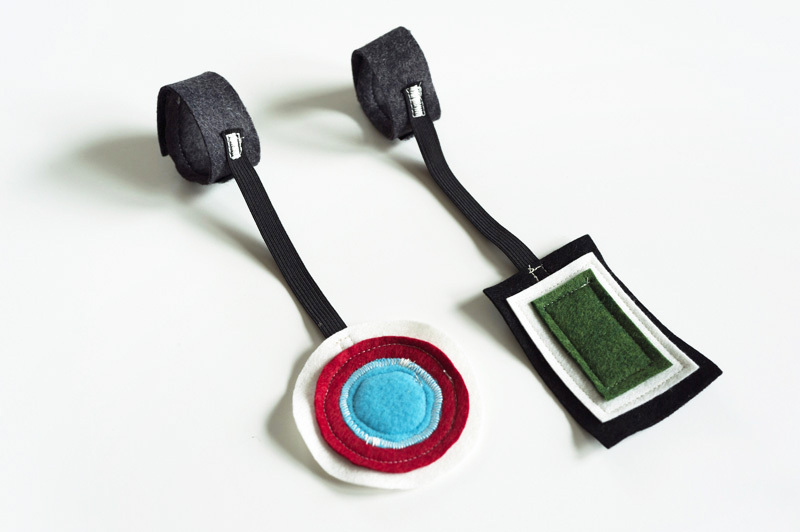 I used high contrast scraps of felt, so they’re soft to touch, and fun for babies eyes to focus on. They were very fast and easy to make, and so far she loves looking at them! Instructions and more photos below if you’d like to try it out! One thing I’d like to do next time is put some crinkle paper inside. I’ve never done that before. What do you all use for crinkle paper for your sewn baby toys? Lastly, most car seat manuals strongly recommend you put the handle down while driving in the car. 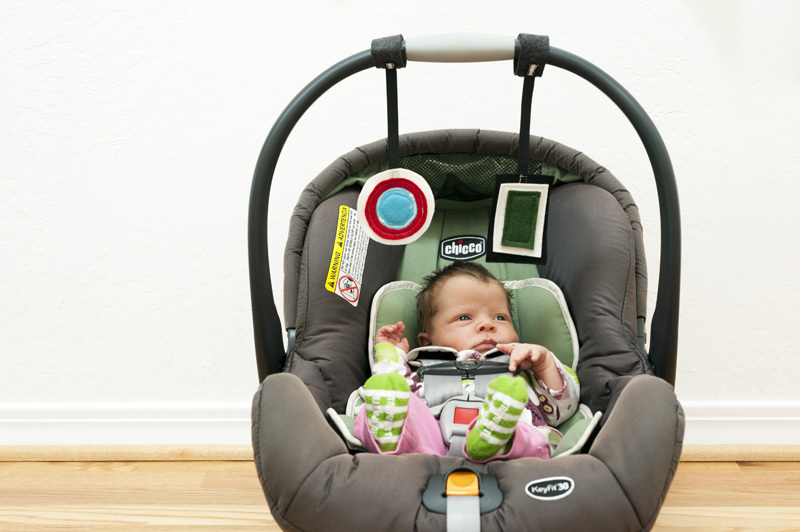 But when you get to the restaurant, or wherever, raise the handle back up and have instant entertainment for baby! 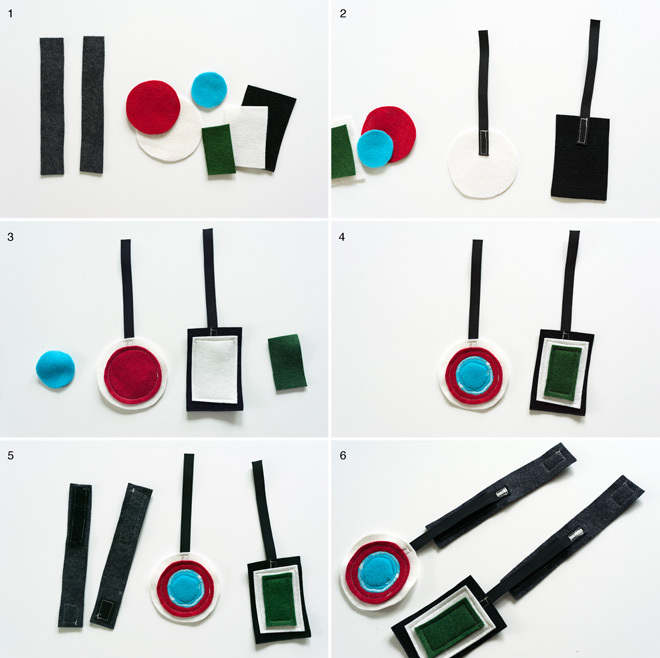 1 – Find some scrap pieces of felt. Use whatever shapes you’d like for the design portion. Then make sure you have a long strip (about 6 inches in length) of felt for the wrap around attachment piece. 2 – Now get a 6 inch length of elastic, and sew one end to the back of the main piece of felt. 3 – Flip it over and start sewing the decorative pieces onto the front of the design. 4 – Sew final pieces onto the design, and if you want to, you can sew decorative pieces onto the back of the design as well. 6 – Now take the main design piece, and sew the end of the elastic to the middle of the felt strip. Done! I have been needing to make these for a while...now I'm going to actually do it! For crinkle toys, sew in hidden layer of chip bag. I have heard that the SunChips bags are very noisy. Those are cute! I'm going to need to add them to the list of things to make for our soon-to-be-born baby. For crinkle plastic, I've used the the bags in cereal boxes before. I think there are probably better options though, so hopefully someone else will chime in! As for the car seat handle recommendation - check your manual. Every carseat has slightly different requirements. We religiously put ours to the back with our son because the nurse in the hospital told us to. However, we have a Chicco Keyfit which only requires the handle to be locked (and there are three locking positions). It'll be nice to leave the handle upright this time around - our car is tiny and it should fit a little better in there this way! These are lovely! Thanks for sharing (these and everything else you do). For anything requiring a crinkle, I use the containers/bags wipes come in. There's always at least one hanging around my house. The new Sunchip bag rocks, but it was so noisy that I don't think they make it anymore. Great idea! I have used the plastic from a bag of baby wipes as my crinkle plastic before. Oh what a darling... you sure have got a cutie pie there!!! I haven't used them yet, but I've read that the plastic windows in envelopes work well for the crinkle...I'm definitely going to try it for a friend's upcoming baby shower! Thanks so much everybody! My crinkle mysteries are solved! I can't wait to try all this out! Great idea to sew through the middle of the crinkle layer! Good work! I've got all the materials ready to do it... except the baby! But my recently-become-mum friend's baby will enjoy it for sure. Thank you for sharing. I use potato chips bags for crinkling. I have used a plastic rice bag before too, and cellophane wrappers. You can also put a small cat toy inside for the jingle bell or squeaker (then if it somehow breaks oepn, the tiny bell/squeaker is still enclosed in a pet toy and not an immediate choking hazard). Thanks everyone! Kelly - That's a very great idea. Actually, even if you didn't have a cat toy, it would be a cool idea to just sew a bell or squeaker into a rectangle of scrap felt or something, so it would be a buffer in case the toy somehow got torn apart. Nice one! Like many of the others, I recycle any crinkle bag for my crinkle toys. As for just using a bell inside a toy, I discovered that it doesn't quite "jingle" right if it isn't enclosed in something else that allows it to move around. Never tried a squeaker by itself though. Thanks for sharing all of you ideas with us! I too use the baby wipe packages. I kinda wrinkle them up before I sew them together for the most crinkle sound effects as possible! I also like the idea of the envelope windows. I just found your blog and am very excited! Looks great. And these little car seat toys are wonderful. So simple and perfect! These designs would be fabulous appliques for t-shirts and onesies! Probably better with less bulky fabric. 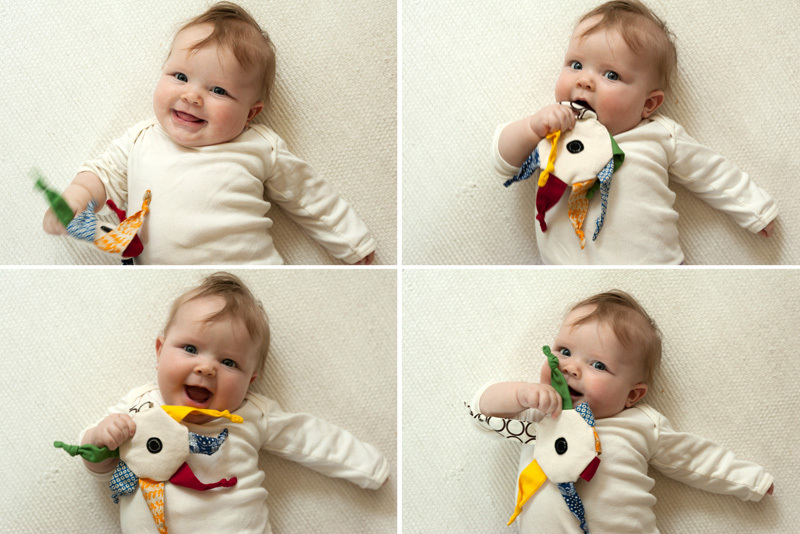 I save our old clothing to use for crafts (as I see you guys do, too - in the fishy toy post!) and this would be a perfect use for those little scraps. Great blog, thanks for sharing your talent! I love this! The carseat/stroller toys sold in the store are way to spendy, imo. Plus these are cooler. I haven't used any crinkle paper yet but the plastic from baby wipes seems pretty crinkly. I've been saving a piece for when I find the time to sew a crinkle toy. Oh wow. I just found your blog and don't know whether to laugh or cry. Laugh coz I love everything you make and want to try it too or cry because I cant make it all right this second! I work in childcare so I know the importance of providing natural materials and what a wonderful array of sensory experiences they provide too. Not to mention cheaper, friendlier to the earth and more aesthetically pleasing, especially for little ones. My nearly 4 year old son is a very creative little soul with the most fantastic imagination. He would love the pillow dolls, finger puppets and especially the zoo blanket!! 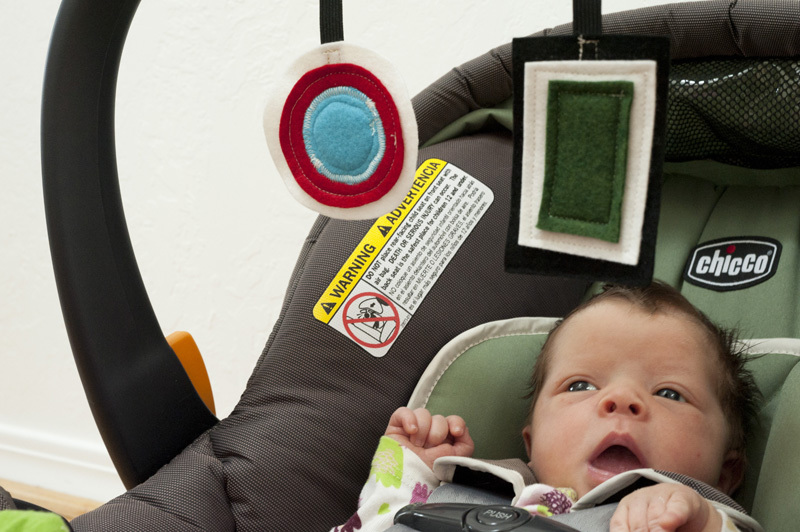 But, I'm going to try the car seat toys first for my 9 week old son. Oh but before that I'm logging on to booktopia to order your book! Thanks for the fantastic ideas! Thanks for the very kind note Kate! So glad you found my site! LOVE this idea! Will definitely be making a batch for friends who have cars and babies!